It turned out to be a good night to test lower temps for hammock camping. Temps expected to drop near freezing. I froze as my improvised underquilt was left unzipped at one end. My hiking partner fared much better. 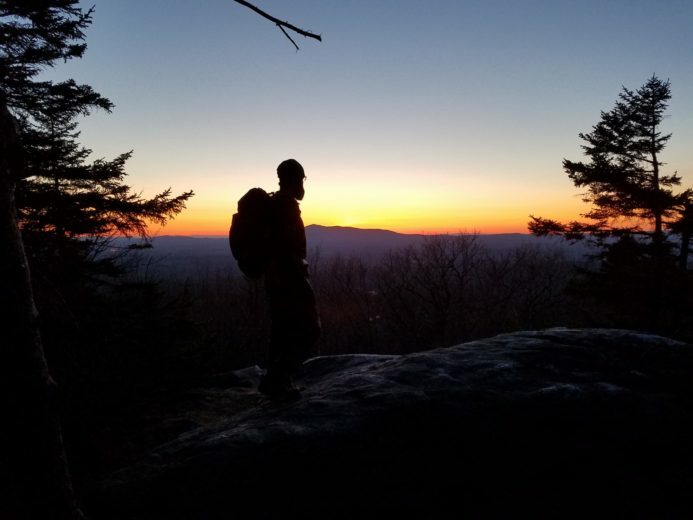 No matter, the camping experience fell significantly short of the amazing sunset views over Mt Monadnock. After setting up camp, we were a bit short on time to make the sunset from a decent outlook. We hiked some and ran some until we found a suitable outlook. I think it turned out quite well. I’ll let these shots speak for themselves. Hammock with converted sleeping bag for underquilt. As you can see the zipper opened resulting in CBS. Brrrr. Joel’s hammock with a ‘stealthy’ SOL underquilt. After some hunting, found a nice hidden camp site. Vertical panorama, who knew that was possible.